We’re eager to see you a week from today in Portland for what will be an inspiring and memorable Oregon Wine Symposium. Ticket sales so far are trending ahead of a year ago by 12%, but it’s not too late to get in on the action. Take 30% off the regular price of each ticket when you register as a group of four or more (send an email for the code). OWA members: don’t forget your discount code saving you another $60 per person. If you’re already confirmed for the Symposium, take a look at these suggested materials to prepare for the sessions that interest you and your team members most. And you’ll want to be sure to join us on the trade show floor at the conclusion of the Symposium’s first day next Tuesday for the debut of the 2018 Oregon Solidarity Rosé. Industry members will preview the wine before it is sampled for media. You may recall this is the first of three Oregon Solidarity wines, with a Chardonnay and a Pinot noir releasing later this year. The Solidarity project brought together Southern Oregon growers and Willamette Valley winemakers to rescue grapes left stranded when a large winery rejected the fruit. 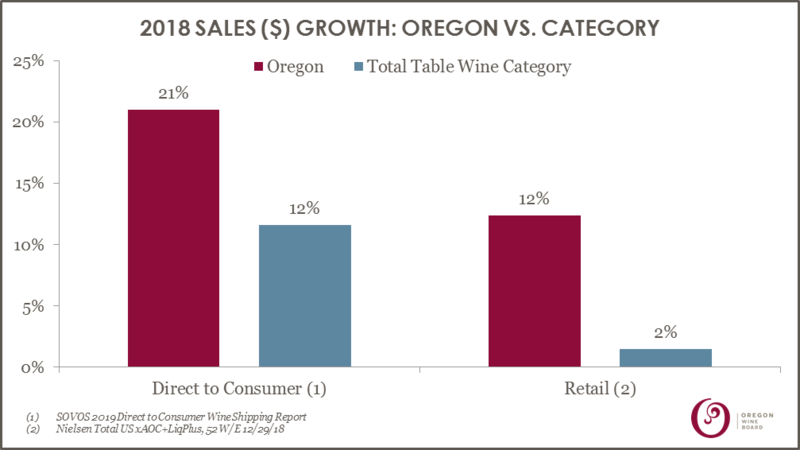 Growth numbers like those can’t be ignored in the business climate we’re in now, and Oregon’s market momentum is generating more interest than ever for Oregon Wine Month 2019. Last year, the OWB’s point-of-sale materials, which are available again this year for free, went out to 32 states and to twice as many distributors compared to 2017. We can top that this year. Similarly, Oregon Wine Month traffic to the OWB’s consumer website doubled last year as people searched for wine country events. So for those scheduling winery activities leading up to and during Oregon Wine Month in May, you’ll want to alert us to your plans so we can help you build awareness and attendance. The best way to avoid missing out on Oregon Wine Month this year is to register now for the Feb. 21 industry webinar during which the whole program, including the OWB’s advertising and wholesaler incentive plans, will be laid out. Ask us more about Oregon Wine Month at Symposium. With Oregon’s 2019 legislative session now under way, OWA’s Board of Directors met last week to discuss the long list of bills offered by interested parties outside our industry with the potential for long-lasting effects on Oregon’s family wine businesses. The list includes a measure that could result in a sizable privilege tax increase (House 2125) for wineries selling 16,835 cases or more per year in Oregon. Another House bill could open the door for more solar power installations on Oregon farmland (House 2322). On the Senate side, there is a move to enable more “farm cafes” on plots with at least 20 planted acres (Senate 449). And of course, OWA is keeping a very close eye on Senate Bill 7, which would lower the blood alcohol threshold used to determine whether or not a driver may be under the influence. SB 7 is a priority for Oregon Senate President Peter Courtney and, so far, has the support of Governor Brown. There are other important wine-related items moving in Salem as well including a truth-in-labeling proposal that, among other things, would authorize OLCC to collect the appropriate wine grape tax from out-of-state wineries crushing Oregon fruit. OLCC currently does not have clear authority to do so, and the latest statistics indicate that 18,000 tons—20% of Oregon’s annual total—are crushed out-of-state. If you support wine industry advocacy on these and other critical items on the agenda this session in Salem, your membership in the OWA is needed now in order to advance and amplify our collective point-of-view. There is no other wine association or organization focusing as intently on these issues. There are many other regulatory and policy issues in play at the moment, which were discussed in detail at OWA’s annual membership meeting last Wednesday. Members also had the chance that day to talk directly with lawmakers at OWA’s annual legislative reception in the state Capitol. We’ll touch on our industry’s statewide priorities at the Symposium next week and we invite you to stop in at booth #124 to speak with us there about items of particular interest to you. See You in a Week! Are You Ready for Symposium? The Symposium kicks off one week from today on Feb. 12 and we can’t wait to see you there. To get the most out of your Symposium experience, consider brushing up on topics of interest before you get to Portland. There are more ways to spend your time during the trade show breaks than ever before. Still on the fence? Learn about a few sessions that will ensure your registration pays back fast. And don’t forget, groups of four or more receive 30% off Full Access passes. Just email for a discount code before Monday. The OWB is returning to Toronto on April 9 to continue its successful tasting events. This year we will host an Oregon Wine Trail event, bringing Oregon to Toronto by partnering with both Oregon and local food producers to create an Oregonian atmosphere. Wineries already in market and those considering market entry are welcome to join and should register by Feb. 15. The 2019 Oregon Wine Month tasting room point of sale materials are available to order now. To amplify the program’s visibility in your tasting room, place your order for POS materials by March 1. The OWB is offering a free 4-week online Oregon wine training beginning March 4 to help members of the trade better understand and more effectively sell Oregon wine. Share the registration link with your trade contacts and have them register by March 1. OWB’s education manager, Bree Stock MW, attended the 2019 DTC Wine Symposium in Concord, California, Jan. 23-24. She has written a summary of the event with key takeaways for Oregon wine producers. Chemeketa Community College, Erath Family Foundation and Oregon Wine Board are sponsoring a class on conventional sprayer calibration techniques, including calibration, maintenance and inspections. The $15 registration fee includes snacks, coffee and tea. Space is limited so register now for the class in English or with Spanish translation, held Feb. 27 at the Chemeketa Wine Studies Eola campus. Retiring and aspiring farmers are invited to one of a series of succession planning and land access workshops being held around the state starting Feb. 13. See the full schedule to learn more and find one near you. Sovos, the company behind ShipCompliant, recently released its 2019 Direct to Consumer Wine Shipping Report. Among other highlights, this report show Oregon’s DTC volume growing at 19% in 2018 compared with the category average 9%. On Feb. 2, Dr. Greg Jones of Linfield College published an updated weather and climate summary and forecast. This report looks back at January conditions and forecasts conditions for February, March and April. A group of Oregon Riesling producers are beginning collaborative efforts to drive momentum behind Oregon Riesling in the marketplace. To start, they invite all Riesling producers in Oregon to take a survey and join their efforts. Do you make Gamay? Do you love Gamay? The third annual I Love Gamay festival, a Portland-based celebration of Oregon Gamay noir, will be held this year on May 5. Interested producers should email Kate Norris by Feb. 15 if they would like to participate. Travel Oregon is now accepting 2019 Wine Country Plates grant applications, with applications due Feb. 22. These grants are available to non-profit organizations for projects promoting wine and/or culinary tourism. Requests for letters of support are due to OWB by Feb. 8. The 16th annual Decanter World Wine Awards is now open for entries, and is especially relevant for wineries doing business in the U.K. and Europe. The deadline for consolidated shipping from California is Feb. 22, with the final submission deadline of March 1. The second annual International Volcanic Wine Conference will be held in New York on June 4 and is now open for wineries to sign up to participate and save 20% off participation fees before Feb. 15. The conference comprises a full-day educational program for wine industry professionals and members of the media. The Cultivating Change Foundation, whose mission is to value and elevate LGBT individuals in the agricultural industry through advocacy, will host its annual Portland reception on Feb. 15. All are invited; RSVP requested. The Oregon Winegrowers Association awarded Senator Arnie Roblan and Rep. Paul Holvey with the 2019 Oregon Wine Leadership Award on Wednesday, Jan 30. Both members have used their leadership roles to advance issues important to the Oregon wine industry and also serve as two of the four co-chairs of the Oregon Wine Legislative Caucus. The International Wine Review recently published a detailed overview of the unique Rocks District of Milton-Freewater AVA. The paper also includes reviews of dozens of wines from this distinctive region. If you submitted an application to the TTB before or during the shutdown and are awaiting approval, if an application that you did not submit due to the shutdown is now urgent, or if you experienced any technical problems with applications submitted during the shutdown, please share your case with Senator Wyden’s staff. They can help ensure TTB is processing applications as quickly as possible and will keep you apprised of progress. The Oregon Governor’s Conference on Tourism aims to educate and connect tourism stakeholders and business partners, advancing alignment for a healthy Oregon tourism ecosystem, which inspires travelers to visit Oregon. Register by Feb. 28 to take advantage of early bird rates. Oregon Business for Climate is a nonpartisan, nonprofit statewide organization focused on mobilizing industry support and business leadership to advance climate policy and institute a price on carbon emissions while strengthening Oregon’s economy. Join nearly 100 Oregon businesses in supporting thoughtful legislation on climate policy.